Feeling a bit better - thanks to all who sent prayers, good wishes, and concern. I appreciate each of you! What do you think? These are just pieces laid down to see the effect. 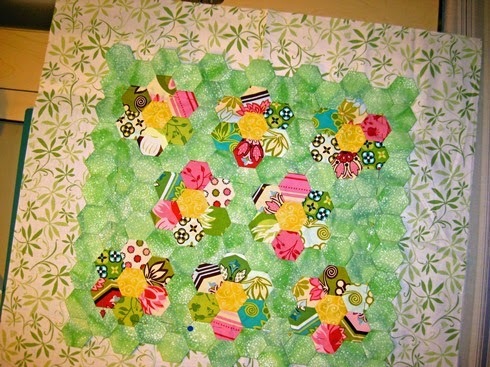 I'm considering the lighter green you can see on the top right and left flower. Not sure. I'll be interesting in hearing what you think. The linky is below - would love to see your eye candy, hexie or otherwise. Closes Monday, midnight. You are right it does need a little something. I do like your idea to add a few applique leaves. 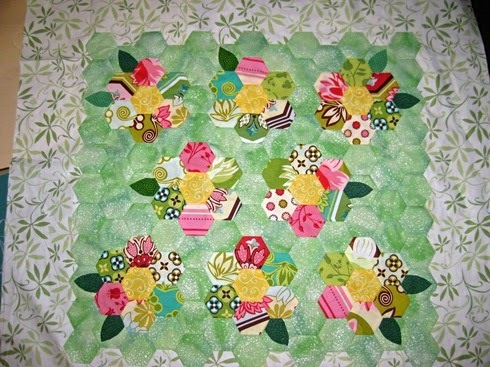 I like the appliqued leaves is several colors. Very sweet little piece! Wow, thats beautiful. I liked the extra touch that the leaves brought. You could keep them different colours. If I should have chosen one colour, I would have made the dark ones. Have a nice weekend! Me encanta tu bloque y me alegre que te encuentres mejor.Besitos y buen fin de semana!! I love the leaves. Go for it! You're right, it needs something more. The leaves are a great idea!! Yes, do it!! Definitely the leaves! I love the colors in there, but the dark leaves add some definition. Glad you are feeling better. Too sick to sew -- now that's sick!! Hope you continue to feel better -- like the leaves but the darker ones pull my attention away from the charming flower motifs. I think the leaves are perfect for your hexie flowers. The leaves are such a great addition! I like the mix of darker and lighter leaves. thanks for linking in with In Hand! nice to find your party, too.